If you are selling, you'll appreciate Doug’s 35 + years of real estate knowledge and experience, professional work ethic and personal care he delivers to every client. In an industry filled with people from a variety of backgrounds, it is rare to find a real estate broker who established their career as far back as 1983. That experience includes executive level disciplines in sales, marketing, construction and resort/project planning and development. No one knows Steamboat Springs buyers better than Doug, and if you’re a seller, that’s very important! From 2000 to 2014 Doug was the Broker/Owner of Buyer’s Resource Real Estate of Steamboat, where he and his company dedicated their efforts on marketing their services to and working for buyers. For 15 years he was the only broker in town who focused his practice on serving the needs of Steamboat’s buyers…time that is invaluable when assisting sellers in positioning their properties in the Steamboat marketplace. After all, the primary reason you are hiring a broker is to find you a qualified buyer. Doug’s office is known as "The Showroom" for Steamboat Springs area real estate. In the heart of downtown Steamboat Springs. Consisting of over 2,200 square feet, it includes interactive displays, several high-tech galleries for visitors to easily search for properties and a resource library filled with market statistics, newsletters and listings. His office is designed specifically to attract buyers, making it the perfect place for a seller to have their property showcased! Doug’s extensive real estate background, coupled with his downtown office designed to attract buyers, the support of the largest real estate brokerage in Steamboat Springs, and his affiliation with a real estate franchise recognized as providing the highest quality service in the industry, makes for a compelling collection of people and services for the successful sale of your real estate asset. 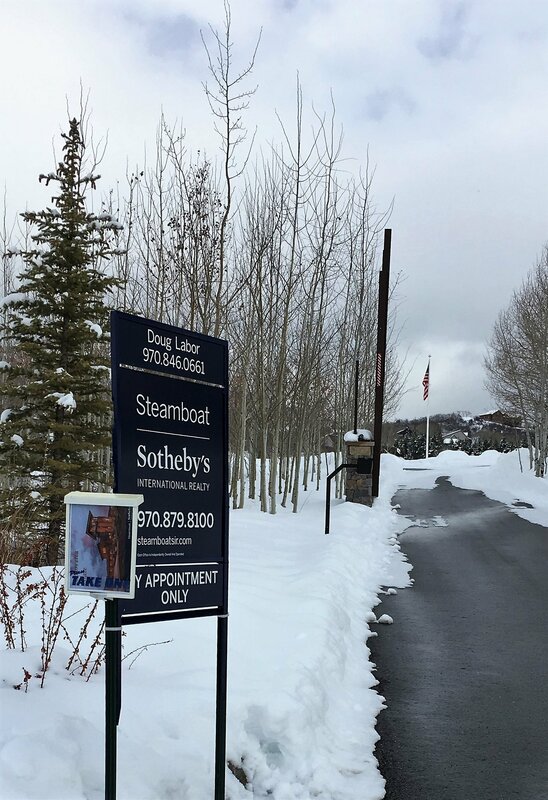 Since 1988 Steamboat Sotheby’s International Realty (SSIR) has been Steamboat Springs’ leading real estate brokerage. Rising atop any industry takes extraordinary thinking and service. Steamboat Sotheby's International Realty has done that for over 30 years. SSIR is committed to providing service that goes above and beyond what is simply expected from a real estate company. This commitment has allowed them to remain at the top of the market, and it's this commitment that will keep them there. The agents and administration that comprise the SSIR team work together in assisting fellow brokers in promoting their properties. They are also the only agency to provide a full-time marketing & graphic design department to quickly deliver effective strategies and eye-catching materials. In addition to the downtown showroom, the main, Wildhorse office, conveniently sits at the gateway to the Steamboat Ski Area, and to ensure someone is always available to help sell your property, the office is open seven days a week. SSIR’s website enjoys a strong presence in the Steamboat marketplace and can be seen at www.SteamboatSIR.com. Connecting buyers and sellers with exemplary service requires skillful marketing, which is what the Sotheby’s International Realty brand provides...worldwide. Founded in 1976 on the same commitment to exceptional service that characterized the Sotheby's Auction House for over two centuries, the Sotheby's International Realty® brand has become known around the world for the distinctive properties it represents. The Sotheby’s International Realty network was designed to connect the finest independent real estate companies to the most prestigious clientele in the world. Affiliations in the SIR franchise system are granted only to brokerages and individuals meeting strict qualifications. Sotheby’s International Realty Affiliates LLC supports its affiliates with a host of operational, marketing, recruiting, educational and business development resources. Franchise affiliates also benefit from an association with the venerable Sotheby’s auction house, established in 1744. A part of this commitment to franchisees and the sellers they represent is a website presence second to none. The Sotheby’s International Realty brand continues to grow its global network. With over 720 offices, and over 15,000 sales associates, the network encompasses 52 countries and territories worldwide. The brand continues to win the Franchise Business Reviews Best in Category for Real Estate Franchisee Satisfaction award. To learn more about the Sotheby's International Realty brand, visit www.sothebysrealty.com. By answering these three questions you will have a better idea if you are truly a serious seller. “Serious sellers” net the most money at closing, have the least hassles and get their desired results in the shortest time. Question #1: Why are you moving? The more compelling your reasons, the more realistic you are apt to be about the realities of the Steamboat real estate market. Question #2: What is your timetable for making the move? Most sellers don’t get realistic about the realities of the marketplace until time is of the essence. Question #3: Are you committed to move? If you are not committed to moving within your stated time frame, you are likely to neglect doing the “little things” that would cause a top dollar - no hassle - timely sale. *Remember, buyers are objective about price and value. They are shopping for the “best deal”. Serious sellers know this and respond by objectively pricing and marketing their homes. Do an honest, detailed "Seller's Disclosure". Check with your agent and/or attorney for details. Offer a “Home Warranty/Protection Plan" to the buyer of your property. See "Home Warranty Policy Checklist... For Sellers". Remove valuable personal property like jewelry, etc. before allowing your home to be shown. Have a lock-box system placed on or by the front door. If this is impossible, have some other system to track who shows the property. Have all necessary inspections that can be done before buyers look at your property. Examples include, but are not limited to building codes, home inspections, title work, etc. This lessens the chance of you losing a buyer due to a surprise after accepting a contract. Never show your property to someone who hasn’t been properly pre-qualified. Hire a real estate agent/company to represent and guide you through the many details of the home selling process. See "Questions to Ask a Listing Agent". Ask for a Free Home Evaluation: A well-priced home will generate competing offers and drive up the final sale value. My free market analysis considers the most actively searched prices and home values and provides you with a detailed evaluation that puts it all in perspective. Connect to a Professional: Contact me anytime you need to know what's going on in this market. When you're ready to take the next step toward selling your home, I’m here to help and to make sure your listing gets the best exposure and reaches the right buyer—whether they're out of state, in another country, or right around the corner.